GAINESVILLE, Fla. – A video of a commencement speech by playwright Lin-Manuel Miranda changed the career path for Weston native, Ines Acosta. Acosta remembers sitting at home at 2 a.m. her freshman year of college and watching the speech. A die-hard fan of the play “Hamilton,” Acosta listened as Miranda talked about seizing the opportunities that come your way. In that moment, Acosta knew she had to change majors. Although she began college as a journalism major, she knew her true passion was animation and design. Growing up, Acosta had always watched animated films. She appreciated the artwork and the story development. 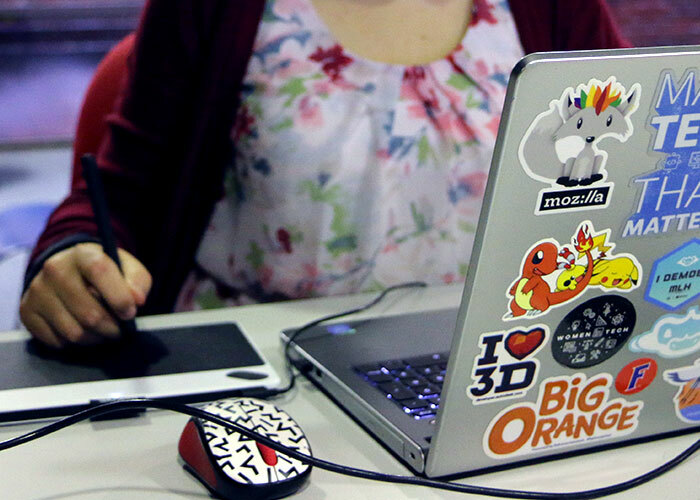 Just a glance at her sticker-covered laptop reflects her dedication to animated work such as Pokémon, the cartoon show “Rick and Morty” and Japanese animation film studio, Studio Ghibli. Acosta was in her first year of the PaCE program at the time and realized that switching majors would allow her to graduate a year early. Transitioning onto campus her second year, Acosta found her home in an organization called the Bachelor of Arts in Digital Arts and Sciences Society (BADASS), of which she was president her senior year. Through this club, Acosta was able to meet some of her closest friends. She remembers one day in the beginning of the school year when one of the girls invited her to GatorNights. A small group of them went together and they bonded over the different activities. 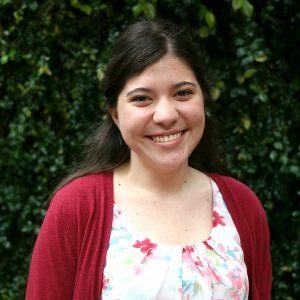 When Acosta wasn’t overseeing the BADASS club or hanging out with the friends in her cohort, she was working as a designer at Luma, a studio at UF’s Digital Worlds Institute that helps local clients with their digital and design needs. “We had access to all the cameras and studios, so it was just really cool to use the industry-standard equipment and to know how to use it,” Acosta said. Acosta is considering going back to school for a master’s degree in animation. In the meantime, she hopes to develop her interests in layout and typography as a graphic designer. Digital Arts and Sciences major Ines Acosta often brought her laptop and drawing tablet with her to Norman Hall to work on her latest sketches and designs for class.